The title of this blog post is pronounced "ag" as in AGriculture. Susun and I both love real ag. Of course, I grew up in The Cornbelt where watching the corn grow was (is) a genuine, respectable cultural pastime. Throughout the Midwest, real farmers grow real crops in vast fields stretching to and beyond the far horizons in every direction. When I moved to Arizona in the late 1970's real ag was still alive there. The Valley of the Sun (AKA: Phoenix) still contained huge orange groves and fertile fields that grew all sorts of vegetables. The Verde Valley was still mostly ag in the early 1980's. Up in Flagstaff, there were even real pinto bean farms north of town. Well, now all those fields have long since been swallowed up by housing developments. Ag in Phoenix is gone. There's no real ag left in Flagstaff at all. Only one farmer in the Verde Valley practices something resembling true ag--that's Hauser & Hauser--and they are rightfully famous for their sweet corn. Watching the annual cycles of ag is an endearing experience that keeps us connected to the land. That's one of the many reasons we love living here in Idaho. We are once again surrounded by real, true ag in every direction. The patchwork quilt of fecund fields is a beautiful sight to see. From the spring plowing and discing of the ground, to the planting season, early growth, maturity of the plants, brown down and then harvest, there's always something to see. The sweet scent of newly mown alfalfa fills the air with a heady scent two or three times each summer. Sprinkler pivots, wheel lines and hand lines spray water in airy curtains over the fields. Meanwhile, the rural areas surrounding Idaho Falls are filled with real farmers living in real farm houses doing real farmer things. Yes, there are a few hobby farms and trophy farms here but they are easy to spot and are few and far between. Farms that are play toys for rich people are the exception here. Down and dirty real farming rules the day. Ag is alive in Eastern Idaho with vast piles of potatoes, mountains of malting barley, waves of wheat and churning green seas of livestock feed and forage. Arguably our favorite time of the ag cycle here is the harvest season. It's hard to pick just one favorite season of the ag cycle when each is so endearing in its own way. However, harvest is the bottom line of success for any farmer. You reap what you sow and it's so fun to watch the reaping process in full swing. So it is now as we write this that many of the far flung malting barley (think beer barley) fields are alive with the roar and rumble and whirr of wildly expensive combines combing precious seeds from the dry stems. You know you live in a real ag town when these very same combines can often be seen making their way through city traffic from one area to another. They literally tower over tiny sedans. It's great to see them and their Bubba Boy operators nimble guide the giant machines through the city's hub-bub. It's a reminder of "all things ag" here and brings both a huge smile to our faces and a swelling sense of pride in our hearts. Today's world of texting and tablets has largely left our urban peoples detached from any connection to how soil , water, seeds and sunshine magically mix to support and sustain our very lives and futures. Food shows up at the grocery store and that's about all most people think of it. Where it came from and how it got there is mostly mysterious, if anyone even bothers to think about it at all. We are grateful for and forever appreciative of our Nation's farmers. Theirs is an unseen, largely unknown and generally thankless life. We're so happy to live here surrounded by REAL ag. 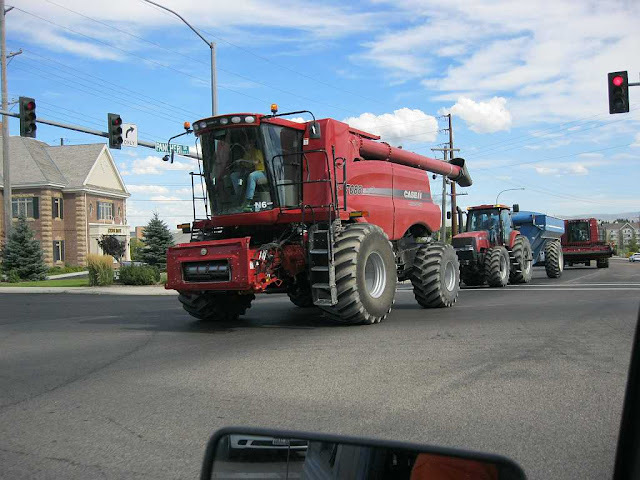 Seeing the annual March of The Machines snake their way through the city, across the river on their way to combine yet another barley field is just one of the many delights of Idaho Falls!